These are the Scuptural Antiques. So when are you going to send the money ? I'm not sure why he needs my money if he has managed to rob the Vatican and several major European museums of their treasures. The antiques look beautiful! I'm sure that you will make a lot of money selling them here in the states. I feel like I've seen a few of them before....I guess you must have agreed to purchase some famous statues. I hope none of them are forgeries. Do you have certification of authenticity for them all? After several go rounds, I get this masterpiece of creativity - love the "seal"
I think my 8yo could have come up with something better than this. 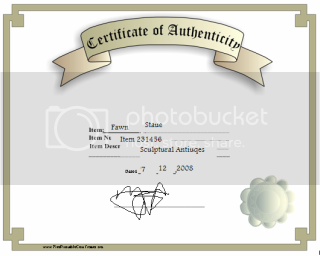 Certificate of authenticity for "sculptural antiques" - priceless. I'd love to know more about the certifying body myself? Perhaps they have a phone number for NTBS to call on Sunday's show? Of course the certificate is a faker, it's missing the universal RSOT!! I am baiting this lad as a wealthy "cougar" and have sent him pics of myself borrowed from "H0usewives of 0C" which make clear the good relationship I have with my plastic surgeon. I have invited him to vacation with me on the beach in Mexico (lotion rubbing mentioned), etc. He keeps begging for money (and rightly so. He DID send the requested certificate of authenticity almost a week ago). I just respond with more pictures and talk of Christmas parties on my yacht. So this morning he sends me a Charles Spurgeon devotion (famous 19th century preacher and theologian). Both of them had an affection for Naomi, and therefore set out with her upon her return to the land of Judah. But the hour of test came; Naomi most unselfishly set before each of them the trials which awaited them, and bade them if they cared for ease and comfort to return to their Moabitish friends. At first both of them declared that they would cast in their lot with the Lord’s people; but upon still further consideration Orpah with much grief and a respectful kiss left her mother in law, and her people, and her God, and went back to her idolatrous friends, while Ruth with all her heart gave herself up to the God of her mother in law. It is one thing to love the ways of the Lord when all is fair, and quite another to cleave to them under all discouragements and difficulties. The kiss of outward profession is very cheap and easy, but the practical cleaving to the Lord, which must show itself in holy decision for truth and holiness, is not so small a matter. How stands the case with us, is our heart fixed upon Jesus, is the sacrifice bound with cords to the horns of the altar? Have we counted the cost, and are we solemnly ready to suffer all worldly loss for the Master’s sake? The after gain will be an abundant recompense, for Egypt’s treasures are not to be compared with the glory to be revealed. Orpah is heard of no more; in glorious ease and idolatrous pleasure her life melts into the gloom of death; but Ruth lives in history and in heaven, for grace has placed her in the noble line whence sprung the King of kings. Blessed among women shall those be who for Christ’s sake can renounce all; but forgotten and worse than forgotten shall those be who in the hour of temptation do violence to conscience and turn back unto the world. O that this morning we may not be content with the form of devotion, which may be no better than Orpah’s kiss, but may the Holy Spirit work in us a cleaving of our whole heart to our Lord Jesus. Since my character is rather shallow and vain, his impulse to convert may be good....but I have so many questions. For example - I didn't even think Oprah Winfrey was married, so how could she kiss her mother-in-law? Oprah is divorced. Ask him if this is his way of telling you he doesn't love you anymore. Just have fun twisting his words against him. Well sweetie, we'll read more about that when we both go to church....It's all in the bible..Sweetie, you haven't tell me when you're going to send the money.. I have way too many questions to be thinking about money!!! women at your church? How do they know Oprah? In marriage and baiting it is always about the money. The car? The house? Which one? Is it perhaps the major cause of wives to have sudden headaches because the poor man twiddles the same old knobs, annoys the neighbours with cries of "Oh Yes Oh Yes" but forgets the wifes name and collapses snoring after 2 minutes of frenzied neanderthal activity, bettering the Olympic sprint record every time whilst the wife prefers a middle distance event? My Mom said to post this, and like a good daughter, did so. 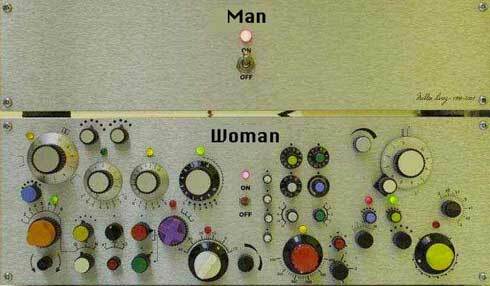 @Dutch: Here's a picture if you need more explanation. I'll bring the topic back...this one looks like fun, becky. But I wanna know, too about Oprah. How did she get involved in this transaction? My word, that woman is into everyone's business these days!